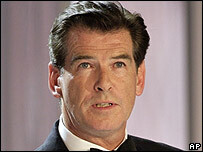 Pierce Brosnan has agreed to be in the big-screen adaptation of the hit Abba musical Mamma Mia. The former Bond actor said he leapt at the chance to act opposite Oscar winner Meryl Streep, film industry tabloid Daily Variety reported. The show tells of a young woman trying to find out the identity of her father, played out to a soundtrack of hit songs from the Swedish supergroup. Brosnan will play Sam, one of the possible fathers. "I said 'yes' right away because it meant working with Meryl Streep," Brosnan said. "Secondly, I saw the show with my family in London, and found it just so wonderfully happy and joyful, and so pitched in time forever in the 1970s. "What a kick in the pants, to be able to go off and spend time with Meryl on some Greek island, singing Abba songs." Brosnan sang Irish folk songs in the drama Evelyn, and sang onstage early in his career but is not normally associated with musicals. Producer Judy Craymer said: "Pierce brings a certain smooch factor, and we think he'll have great chemistry with Meryl in a romantic comedy. Since its opening in London in 1999, Mamma Mia has grossed more than $2bn (£1.03bn) in worldwide ticket sales, making it one of the most successful musicals of all time.